The Eurasian Three-toed Woodpecker (picoides tridactylus) was originally described as Picus tridactylus in 1758 by Linnaeus and later named in the genus Picoides Lacepede in 1799. 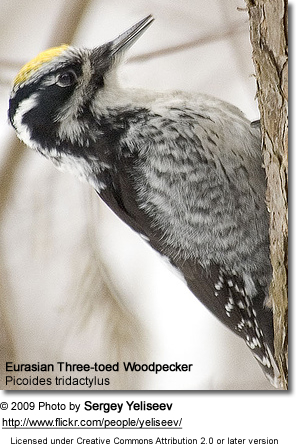 In 2003, this Three-toed Woodpecker was split into the American Three-toed and the Eurasian Three-toed Woodpeckers. The Eurasian Three-toed Woodpecker is the only woodpecker in the world whose breeding and roosting habitat extends farther north than that of the the American Three-toed Woodpecker. Most woodpeckers have four toes on each foot, but the Three-toed and Black-backed Woodpeckers have only three. Having just one large, strong toe on the back of the foot gives them the stability to deliver more powerful blows than their four-toed cousins, but it has come at the expense of agility and climbing expertise since it is stationary. Four-toed woodpeckers are able to rotate that toe, but three-toed birds are not. The Eurasian Three-toed Woodpecker’s numbers are declining due to the felling of the old coniferous forests and fragmentation of the massifs (mountain ranges). These areas provide them with food and habitat, particularly in the Pirin National Park in southwest Bulgaria. There, they have a great deal of competition for food and habitat by other woodpeckers. However, more recently, the Bulgarian government has begun protecting their national biological treasures with the conservations acts they have put into effect. The Biological Diversity Act is included in the Red Data Book of Bulgaria (1985) and declares that the mountains of Pirin and Rila are to be national parks, and the Rila Monastery is to be a nature park. There are also strict reserves within their territories, preserving 65% of its population. In the early 1900’s, it was commonly seen in some areas of the Rila mountains, but up until the end of the 20th century, only the registered breeding places in the mountains Rila, Pirin and the Western Rhodopes were recognized. However, between 1995-2005, the EurasianThree-toed was discovered in additional regions of those three mountains as well as in Vitosha mountain. More recently, it was registered in the reserves of Mantaritsa and Soskovcheto and above Prespa Hut, in the Western Rhodopes. Their numbers are not large, however. Only 90-130 breeding pairs exist in the Western Rhodopes, 140-230 breeding pairs are in the Rilo-Rhodope meta-population common for Bulgaria and Greece, and 80-290 breeding pairs dwell in the Western Balkan meta-population. Since this species dwells in the boreal forests and montane coniferous forests across its Eurasian territories, very few people have observed it. They prefer mature forests with abundance of insect-infested snags. They also utilize dying trees and stands of trees disturbed by disease, fire, or other disasters. These old forests, mainly spruce, attract the Eurasian Three-toed Woodpecker, and he will most often choose trees which reach high altitudes. Plumage becomes darker and birds larger from north to south. Range: Northern Europe east across the southern taiga to Altai Mountains, northern Mongolia, Manchuria, Ussuriland and Sakhalin. Range: Northern taiga from Urals east to the Sea of Okhotsk. Range: Kamchatka Peninsula in the Russian Far East. Range: Mountains of southern, southeastern and central Europe, Tian or Tien Shan., northeastern Korea and northern Japan (Hokkaido). Range: Southwestern China to Tibet. Eurasian Three-toed Woodpecker (inouyei) (Picoides tridactylus inouyei - Yamashina, 1943) - not universally recognized as a separate species. Proposed to be merged with ssp. alpinus. Range: East central Hokkaido (the northernmost of Japan's prefectures). Eurasian Three-toed Woodpecker (kurodai) (Picoides tridactylus kurodai - Yamashina, 1930) - not universally recognized as a separate species. Proposed to be merged with ssp. alpinus. Eurasian Three-toed Woodpecker (tianschanicus) (Picoides tridactylus tianschanicus - Buturlin, 1907)- not universally recognized as a separate species. Proposed to be merged with ssp. alpinus. Range: Tien Shan (or Tien Shan) - ,a mountain range located in Central Asia. Both males and females reach a length of about 7.9 in. (20 cm) and weigh 2.3 oz. (65 g). The Eurasian Three-toed Woodpecker is easily identified since it is the only woodpecker to have a yellow cap. It is also one of only two black and white woodpeckers to lack any red in its feathering. Compared with some of the other woodpecker species, it appears quite dark and black due to the small amount of white on its wings. The nominate of the species, when viewed from behind, shows a white panel in the shape of a Y and white bars on the sides of head. A black stripe also runs down the neck from the nape to the mantle. White markings are on the throat and chest, and the flanks and lower under-parts are a cream or off-white color blending with some grey markings. These markings appear even more pale when the bird is in flight as the cream-buff underparts become more visible. Its black facial feathers display white markings, and a white superciliary line broadens as it extends back from its dark red iris toward the neck. These markings merge with white markings behind the ear and run down to the mantle. There is, in addition, a wide, black malar stripe extending from the throat to the breast. Some birds possess a white space between the bottom of the bill and the malar area. The throat and upper breast are white, while the innermost scapulars, lower back, and rump are black. There is a hint of brown in the outer scapulars and upper-tail coverts. The wings are black but less shiny than those on the body. The wing-coverts are often dotted with fine, white markings, while the flight feathers display broader white spots, giving the plumage a barred look. The tail is mostly black, although the outer three rectrices on both sides display spots of white. The long, broad bill is grey with a darker maxilla, and the legs are shaded grey. The northern nominates possess cleaner, brighter white plumage than the southern members of the species. When viewing the Three-toed Woodpecker, one will notice a compact, solidly built bird whose head is large, neck is short and tail is blunted. When comparing the male and female, the male’s most outstanding feature is his crown; males have a yellow cap which can vary in its coloring. It can range from a bright lemon to a mustard color, and it sometimes contains some black speckling. There may even be some white feathers adorning the crown. The forehead is black with white flecks. The black feathers surrounding the yellow crown are quite glossy. The female lacks the yellow feathers on its crown; her crown is black with grey or white speckling. This feature facilitates differentiation in the field. Males display longer black and white bristle feathers around the cere than the females. Also, the males are larger in size and weight and have longer wings, legs, and beaks than the females. These features are an advantage over the female since they allow the male superior foraging and feeding techniques. The immature male appears quite similar to the adult male. He even sports a yellow crown patch, but it won’t be as bright or large as the adult’s until maturity. The general plumage contains some brown tones and is more subdued rather than the polished black of the adult. The feathers on his back show less white than the adults, and there are often some grey markings on the back. The buff ventral feathers contain larger bars than the adults, and the tail is shorter and more wedged. The eyes are closer to pink than the deep red color of the adult’s eyes. The juvenile female looks much the same as the juvenile male. She will sometimes display some yellow on her crown, but the area is smaller and less obvious than that of the adult male. The Eurasian Three-toed Woodpecker resembles the Hairy Woodpeckers, but can be identified by the barred flanks, much darker face and the narrow postocular (facial) stripe. Black-backed Woodpecker can be differentiated by their entirely black back, postocular (facial) stripe which does not extend down neck, and the entirely white outer tail feathers. Like most woodpeckers, the Eurasian Three-toed consumes mainly insects; these make up 95% of their diet. They also forage for xylophages (wood-eating insects, such as termites) and their larvae, the bark beetles and wood-boring beetles and their larvae, all of which are found in dying trees with loose bark and soft wood. The Eurasian Three-toed Woodpecker will nest in a cavity in the trunk of a tree and line the hole with wood fibers or chips. In central Europe, the birds prefer to breed in old forests, mainly in spruce trees. Breeding occurs in May up to the beginning of June, after which the female will lay from 3-5 white, round eggs. In central Europe, incubation continues from the middle of May to early of June, about 14 days. The eggs will hatch at the beginning of June, and by the end of the month the birds will have fledged and left the nest. Like its cousin, the American Three-toed Woodpecker, the sound made by the Eurasian is a "quap," “pik”, “wik,” or "quip." He is also secretive, so one will not hear his call too often in the wild.